During Tet, or the Lunar New Year celebrations that ended on Sunday, many theaters and book streets in Ho Chi Minh City recorded an increased number of visitors, an indicator that these places were no less attractive than other entertainment destinations in the holiday. Tickets for plays were sold out while two book streets in the southern metropolis collectively attracted nearly one million visitors, according to data obtained by Tuoi Tre (Youth) newspaper. While Nguyen Van Binh, located in District 1, is known as the biggest book street in Ho Chi Minh City, a similar venue is held as part of the annual Nguyen Hue Flower Street in the central business district every Lunar New Year holiday. This year, the Nguyen Hue Book Street, stretching from the Nguyen Hue intersection with Ngo Duc Ke Street to Mac Thi Buoi Street, was open from February 2 to 8, as was its flower counterpart. Many of the visitors who came to the flower street for a pleasant stroll during the Tet holiday also stopped by the book street for some reading and buying new books for the new lunar year. Organizers hoped that having a book section at the annual Nguyen Hue Flower Street would help encourage reading among Vietnamese, particularly young people, and the idea has always been embraced by local publishers. This year marked the ninth time a book street has been held along with the flower street, even though publishers always have difficulty finding employees willing to work during the country’s biggest public holiday. The Nguyen Hue Book Street received some 800,000 visitors during its nine days of opening, generating some VND3 billion (US$130,000) in revenue, according to the venue management. 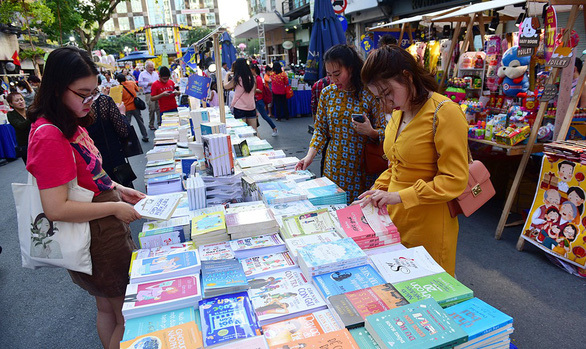 Fahasa, one of Vietnam’s book store giants, took advantage of this year’s Nguyen Hue Book Street to introduce 5,000 new book titles of all genres, with around 50,000 copies. The Fahasa booth at the book street also offered discounts on books and held book-signing events to attract readers. In the meantime, ten bookstores and publishers at Nguyen Van Binh Book Street remained open throughout Tet so as not to displease any book-loving visitors. The three-year-old book street reported revenue of VND921 million ($40,000) from over 80,000 visitors through the holiday. Nguyen Van Binh Book Street turned itself into a must-visit Tet attraction by offering various activities, such as ‘check-in’ points, ‘selfie hotspots,' a children’s playground, and a caricature drawing service, to attract all kinds of visitors, even foreign tourists. The book street also featured a bus library - a small reading room designed as a local bus that served many ‘passengers’ during the holiday. Another favored activity during Tet in Ho Chi Minh City was enjoying theatrical performances. Even such insiders as Hong Van, a well-known director and owner of two theaters in the metropolis, did not expect tickets to sell out during the Tet break. Ahead of the holiday, Van was worried as ticket sales were at a disappointing rate, “but demand increased dramatically when Tet neared,” she told Tuoi Tre. On February 5, the first day of the Lunar New Year, the website that sells tickets to Hong Van theaters were overloaded with traffic and eventually crashed. But Van was more than happy even though she had to turn to ‘offline’ methods to sell and deliver tickets to her customers, as all of the three shows a day at both of her theaters were fully booked from the first day of the Lunar New Year. Tickets for all shows at the Dramatic Theater of French Culture Exchange Institute (IDECAF) also sold out well before Tet began. For people in the theater industry, performing during Tet is a pleasure. This is why My Uyen, director of the 5B Theater in District 3, was happy that she and her actors and actresses could meet their audience again after a five-year hiatus during the 2019 Lunar New Year, even though their tickets did not sell out. Many audiences had been waiting for the reopening of 5B, among them “an 84-year-old man who had to take three flights just to be able to watch a play here,” Uyen said with emotions.